The nose has dry bonfire smoke, charcoal, heather, and balsamic vinegar. The mouthfeel is thin with no cling. The body has lemon, apricot, heather honey and then the smoke rolls in - the same as on the nose. 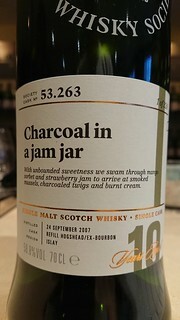 The finish is the smoke, with lemon and hints of honey. Water brings out thin, rapidly expanding whorling that dissipates without settling. The nose now gains ash and hints of brine, and loses the heather and balsamic vinegar. The body gains ash, lemon and loses the heather honey. The finish loses the honey, and gains ash. A superb expression which delivers a decent set of flavours in a way which is bound to find fans.